As a product intended for the new installation of PV storage generators, EM/ES series are aimed for boosting self-consumption in areas with high electrical rate and a relatively low FIT. For areas and regions where peak shaving can be applied and feed-in-power is restricted, this system would be a good fit. •　Increasing Self-Consumption: During the day, the electricity from the PV array is used to optimize self-consumption. The excess is used to recharge the batteries and can be released to the loads at night. The highest proportion of self use is up to 95%. •　Peak Shaving: By setting the charging and discharging time, the battery can be charged using the lower electrical rate and discharged to loads when there is a high electrical rate. •　Power Supply for Important Loads: Connected to the backup side of the inverter, loads such as refrigerators, routers, lamps, computers and other small appliances can be powered. When grid fails the system automatically switches to back-up mode within milliseconds. 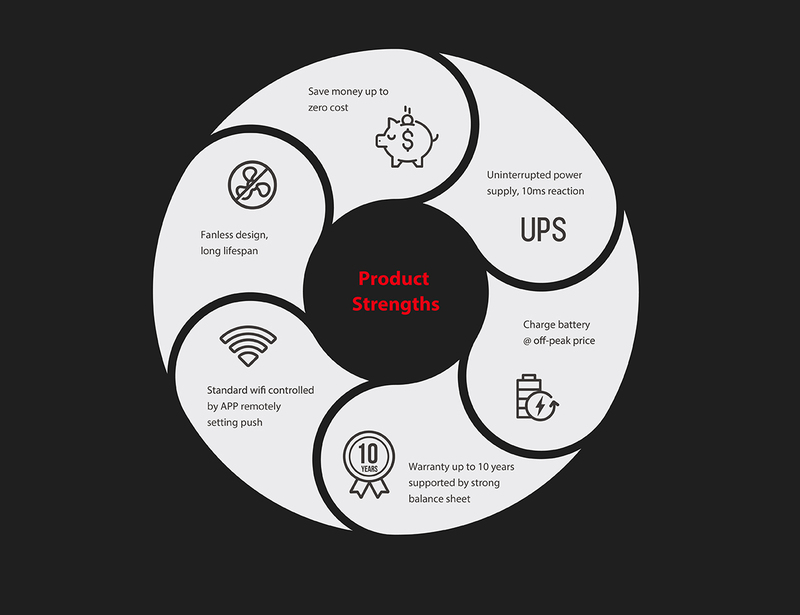 SBP product series is geared up for areas where there is considerable price gap between peaking and valley period or a limitation in power supply with no allowance for the installation of PV panels. • Peak Shaving: Economic Mode allows you to set the time period on a flexible basis. • Power Supply for Important Loads: Connected to the backup side of the inverter, loads such as refrigerators, routers, lamps, computers and other small appliances can be powered. When grid fails the system automatically switches to back-up mode within milliseconds. BP series, a product that aims for situations where there is a high electrical bill and a low FIT, is designed for upgrading to DC-coupled storage system based on the existing PV on-grid inverter, helping to reduce your bill by boosting self-consumption. As a product intended for the retrofit of PV storage generators, SBP series is aimed for boosting self-consumption in areas with high electrical rate and a relatively low FIT as well as the availability of peak shaving. Compared with hybrid energy storage inverters, SBP is more cost-effective. ES series is fit for areas like remote villages, powerless areas, ocean islands, and off-grid applications, ensuring household power demand needs are met. •　Meeting power supply demand: the energy output from the PV side will be supplied to the load as a priority before the surplus energy flowed to the battery for charging, which shall be discharged for powering the load when there is no sufficient electrical supply from the PV side.